Regional metamorphism causes rock cleavage and associated parallel sets of joints in rocks containing platy minerals that are susceptible to crystal grain alignment. Higher amounts of directed stress and higher temperatures contribute to better grain alignment and more distinct cleavage. 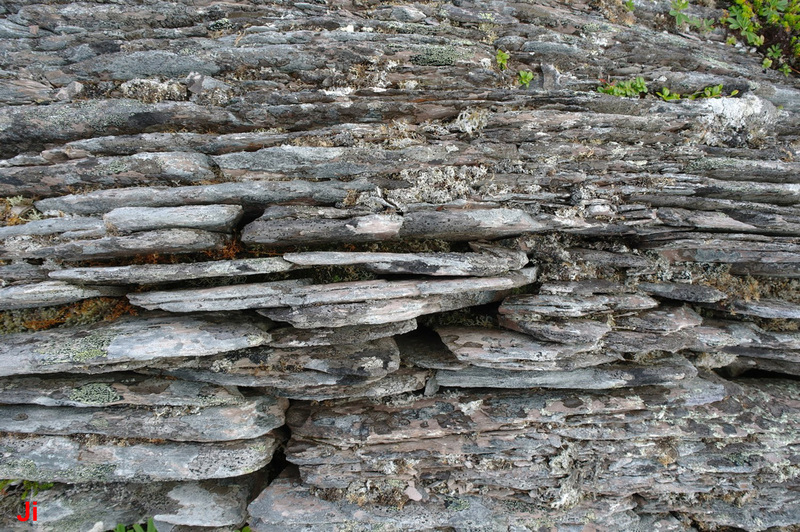 Directed compressional stress is limited in rocks near the surface by the tendency of rocks to relieve stress by folding or undergoing brittle failure. The most pronounced cleavage is found in rocks with high phyllosilicate content that were exposed to moderate directed stress and elevated temperatures. Some outcrops in Heart of Avalonia exhibit these conditions. 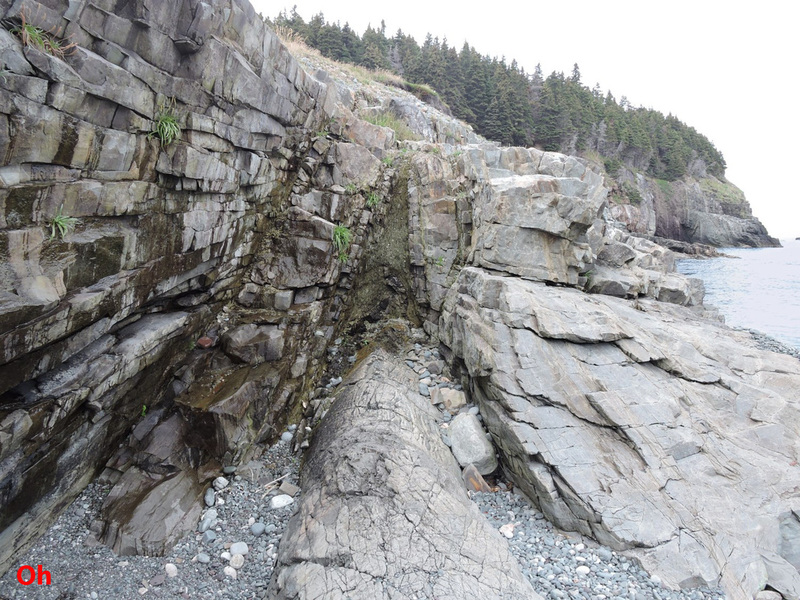 Most such outcrops occur near the north-west boundary of the region, within a few 10's of km of the Dover-Hermitage Bay fault line. Compressional stress acting roughly normal to the D-H fault is evident throughout Heart of Avalonia and even 150 km from the fault there are steeply folded rocks and abundant indications of rock cleavage. This is unsurprising given that Heart of Avalonia became wedged deeply into the middle of Pangea and that the mantle underlying the entire region south-east of the fault line seems to have deformed more-or-less homogeneously for millions of years. 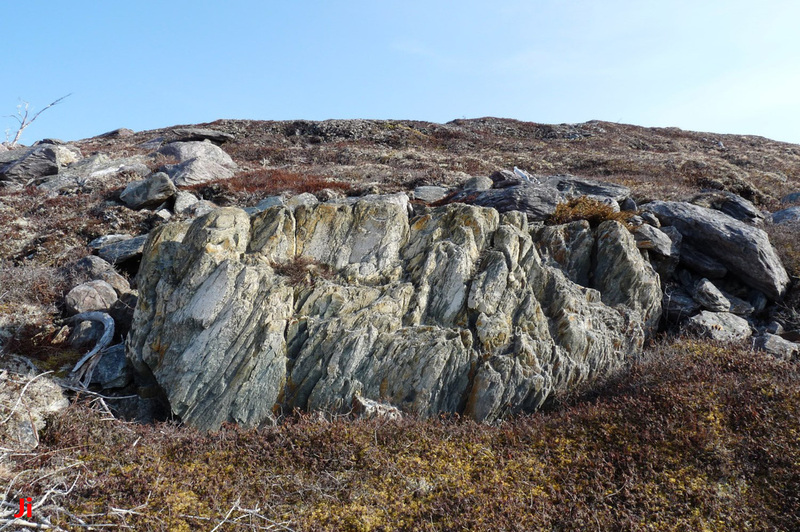 The photos below show two examples where exposures of schist or schistose rocks were observed with accompanying observation of strong cleavage. In both instances, elevated temperatures and metasomatism may have played a key role in producing the schistose texture. 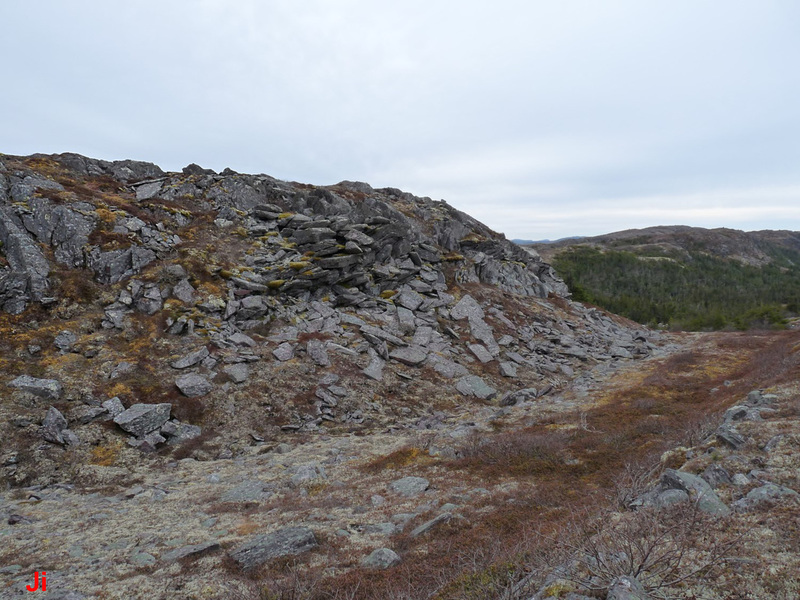 The location shown in the first picture is about 45 km from the D-H fault and about 25 km from the edge of the Ackley granite pluton. 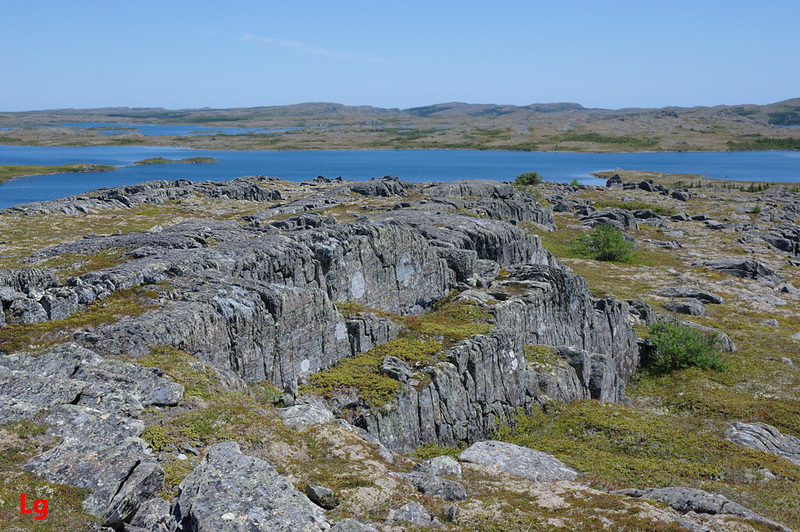 Although the Ackley granite intruded in phases beginning after motion on the fault had ended, such a large-scale intrusion of magma might have been preceded by a high geothermal gradient in this region and/or intense hydrothermal activity. 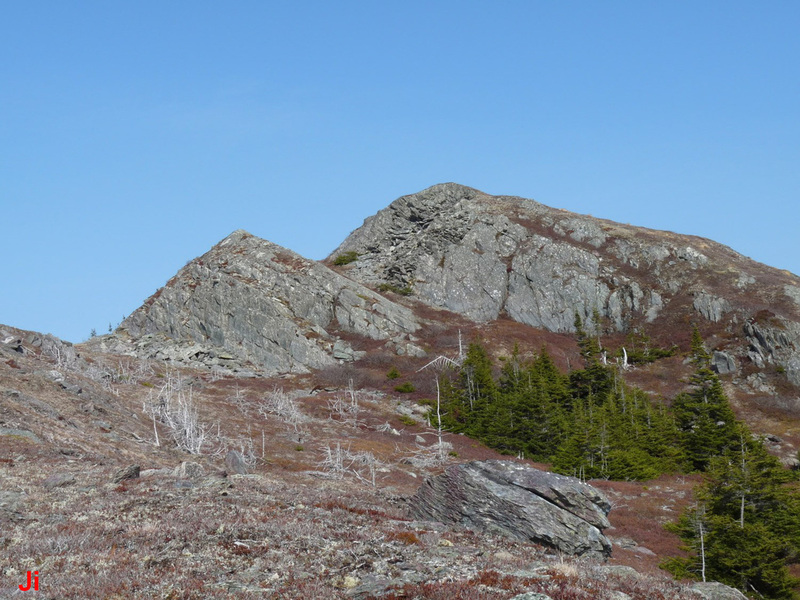 The rocks shown in the left picture included abundant mica schist and were metamorphosed sufficiently to make it hard to tell if they were originally volcanic or sedimentary. 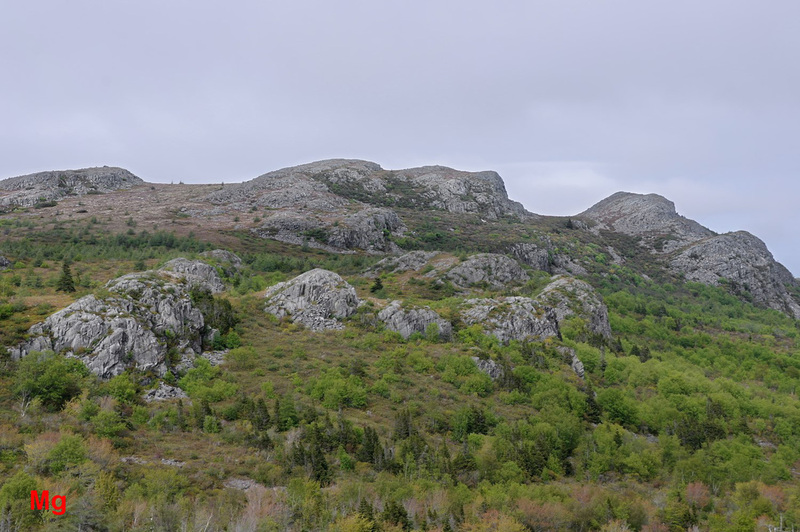 The rock exposure shown above on the right is located 25 km from the D-H fault and was not affected by magmatic activity during the Acadian orogeny. The rocks at this location were largely comprised of a dark green chlorite schist, lightened in color by surface weathering. 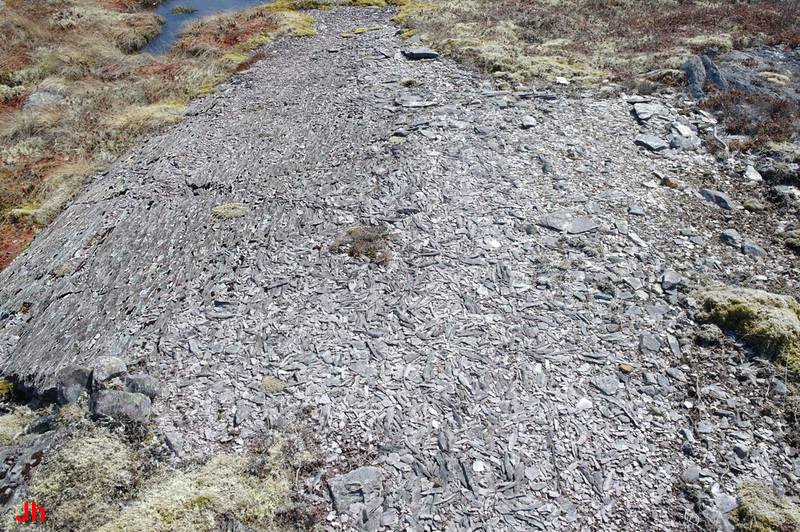 Both of the samples shown above are mica schist. 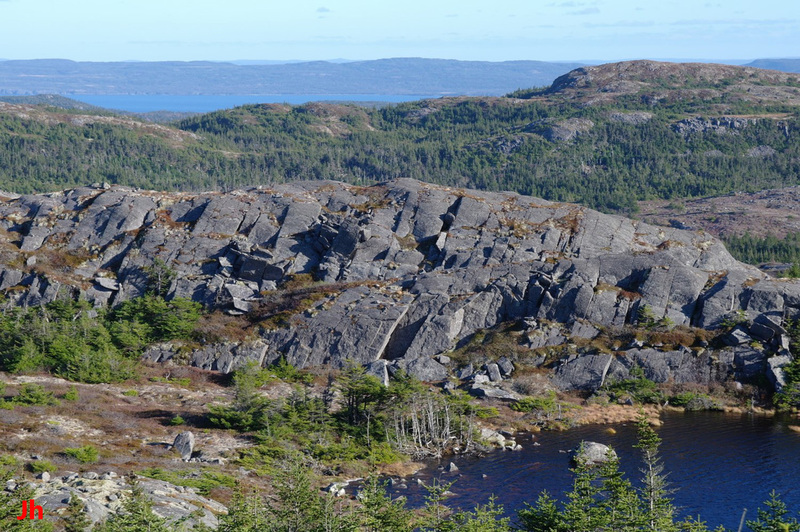 The first sample (10 cm width) is from the location pictured above on the left, near the Ackley granite. This sample contains chlorite and magnetite as well as muscovite. The second sample was collected at a location (not pictured) a few hundred meters from the center-line along the Hermitage Bay fault. 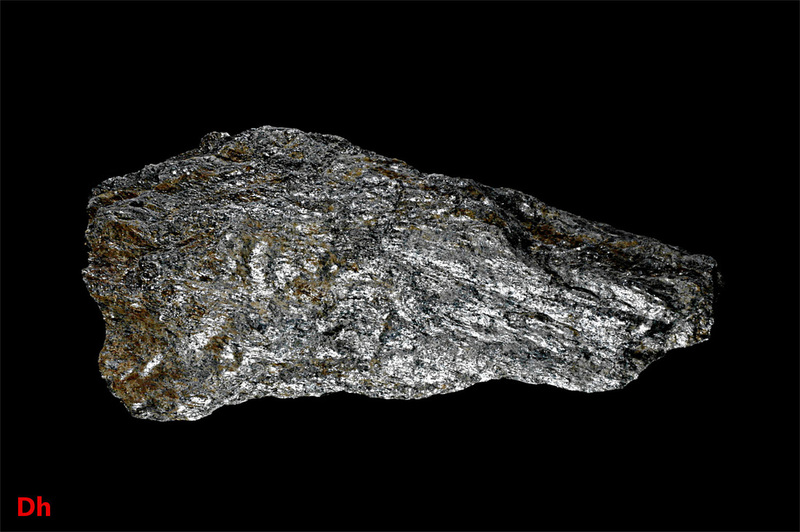 This sample (about 30 cm width) is mainly muscovite and the schistosity might be more a result of shear stress than compression. It is included here to further illustrate the higher grade of metamorphism close to the fault. Both of these specimens exhibit distinct cleavage in the plane of the photo. Anticlines and synclines are easiest to visualize when viewed at a cliff face perpendicular to the axis of the fold. Below are three examples of anticlines and their associated planes of weakness. The left photo shows an anticline in shallow-marine or alluvial clay-rich sedimentary rock. 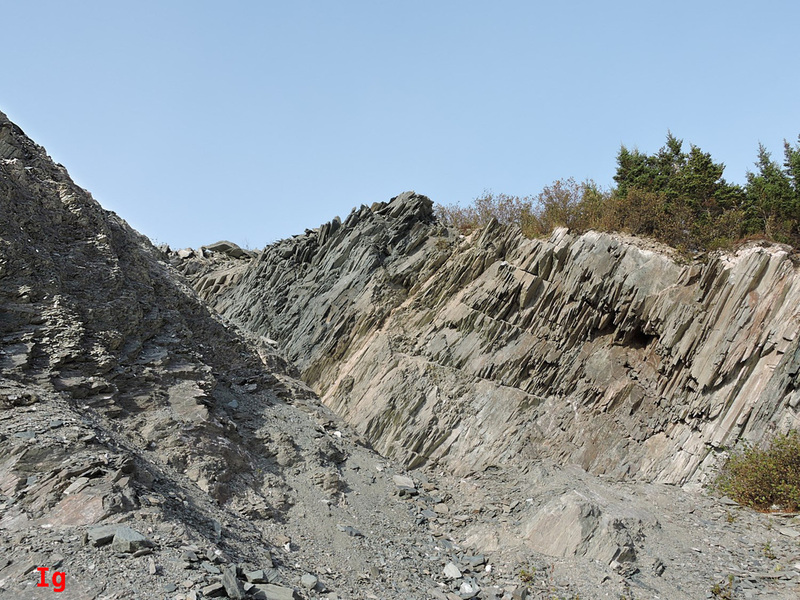 The adjacent photo is a detail of the left-of-center region of the first picture and shows the vertically-dipping tectonic cleavage induced in the rock when the fold was formed. This rock possesses two planes of weakness, the tectonic cleavage and a less distinct tendency to separate on the bedding planes. 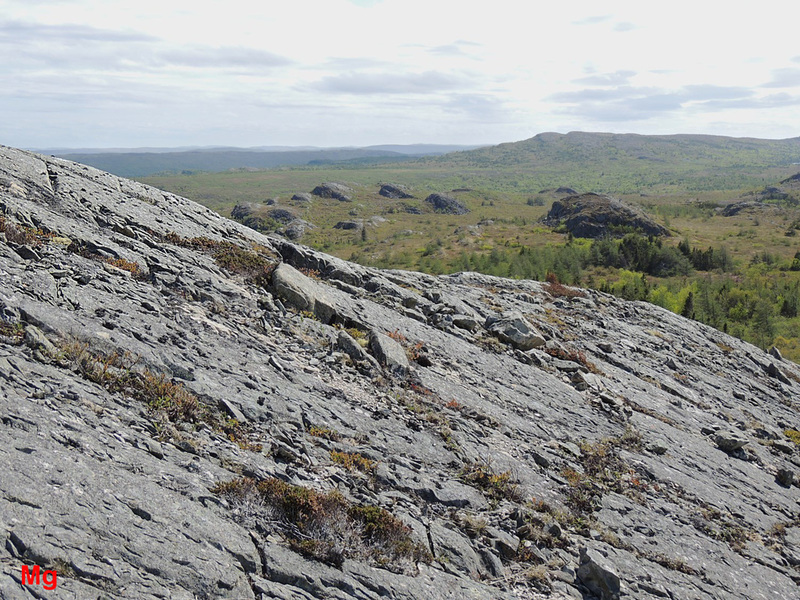 The scree below the cliff (right photo) shows flat, even breakage surfaces on the tectonic cleavage, while the bedding-plane surfaces are irregular and indistinct. The pictures above (right is closeup of left, center) show an antiform (convex upward fold without stratigraphic layering) in fluvial sedimentary rock. The regularly-spaced longitudinal joint set might reflect planes of weakness from compressional stress/phyllosilicate alignment, or the joints might be the result of tensile stress developed in the upper portion of the fold. The coastal rock exposure shown above ("A"-shaped fold about 1.5 m high) contains a tightly folded sequence of sedimentary beds alternating between quartz-based sandstone and clay-based siltstone (green). The siltstone layer has developed intense cleavage from a mixture of compressional and shear tectonic stress. This weak phyllosilicate layer has accommodated deformation in a ductile manner, whereas the sandstone has undergone brittle failure. The joint set in the sandstone likely developed in the earlier stages of compression when the rock was either flat or when the fold had a larger radius of curvature. 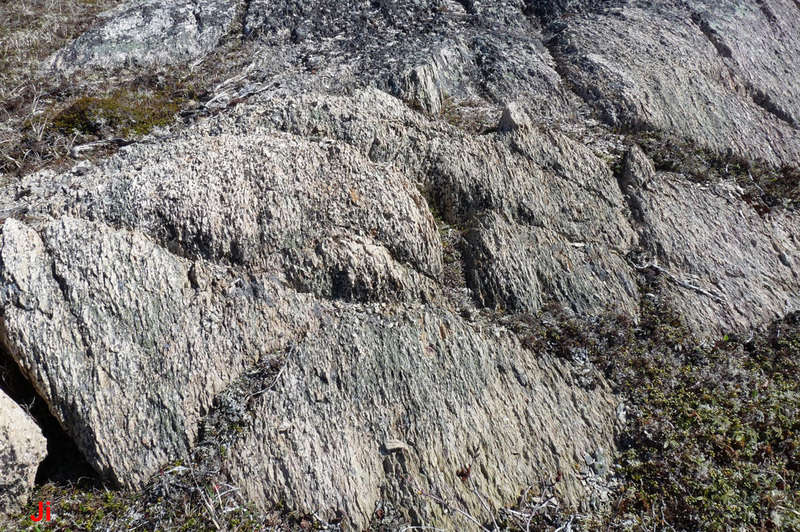 Top right: Longitudinal joints in sedimentary rock widened by erosion and frost wedging. 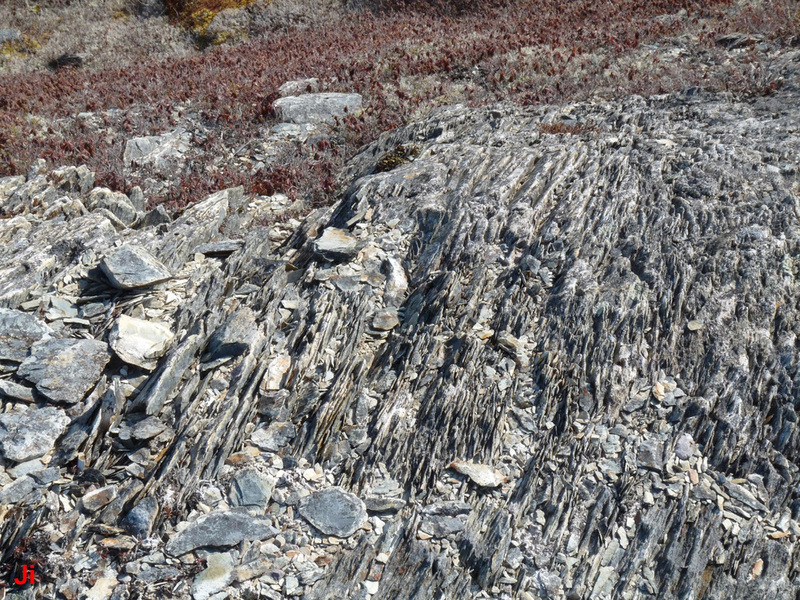 Middle right: Longitudinal cleavage evident in sedimentary rock. Repeating joints likely widened by frost wedging. Bottom left: Eroded bedrock surface showing alluvial sedimentary rock with pronounced longitudinal cleavage. Bottom right: Small outcrop (~2 m across) of volcanic rock. Longitudinal tectonic cleavage indicates presence of phyllosilicate minerals. The hill shown below (two views, farther out and closeup) was eroded by ice flowing left-to-right or toward the camera, or both. The ice erosion cleaved off sections of rock where failure occurred on the distinct up-sloping tectonic planes of weakness. 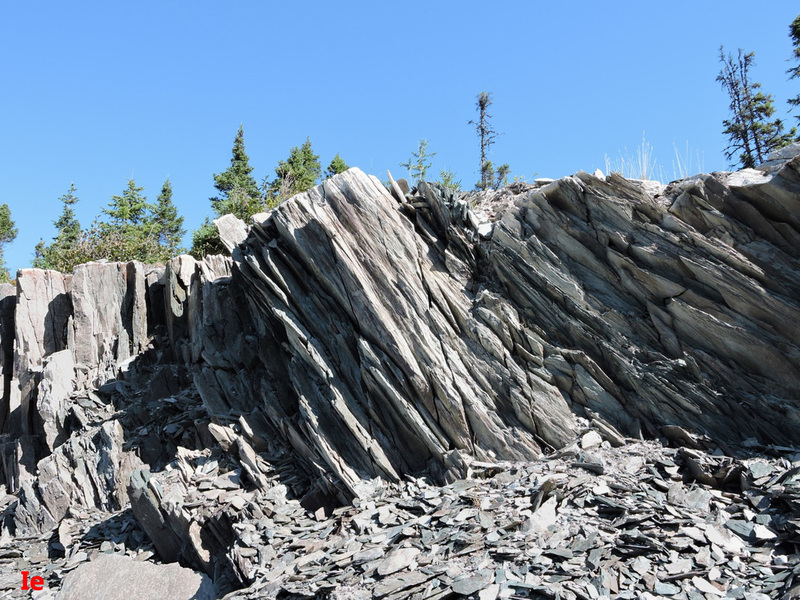 The rock was fine-grained, of sedimentary origin and showed prominent cleavage and jointing from directed compressional stress and/or shear associated with folding. Bedding planes were difficult to discern in this rock and played no apparent role in guiding the erosion. 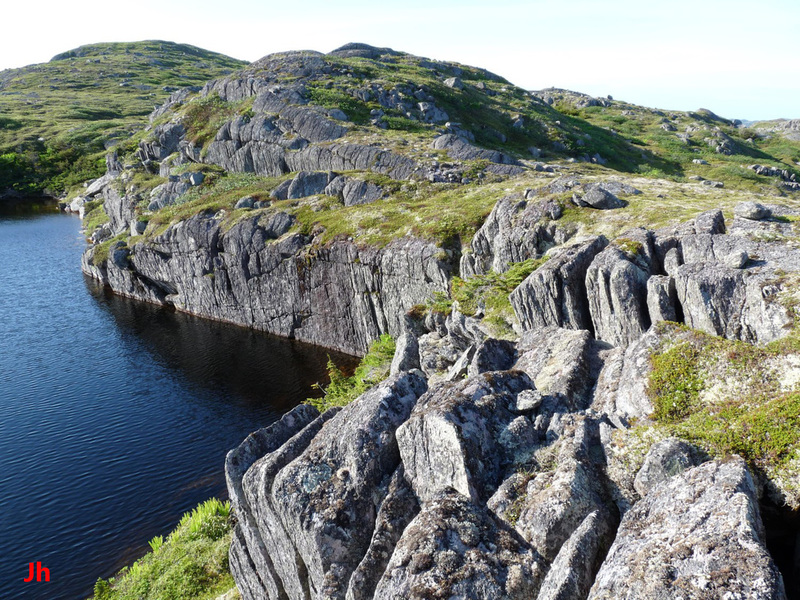 As well as the dominant longitudinal jointing producing the flat surfaces shown, cross jointing (also of tectonic origin) facilitated the formation of joint blocks, flat-sided angular boulders as seen in the foreground. Ice flowing left-to-right would tend to frost-wedge or pluck joint blocks and deposit them to the right of the hill. Ice flowing toward the camera would transport blocks of plucked rock toward the foreground while aiding in smoothing the rock on the up-sloping cleavage planes. Landforms known as cuestas, homoclinal ridges or hogbacks all embody an eroded sloping surface of rock ending abruptly in a cliff or steep slope that cuts through the plane of dip. Typically such landforms result from the erosion of tilted sedimentary beds where planes of weakness corresponding to alternating weaker and stronger layers in the bedding define the slope of failure. The features shown above are similar but arise from a distinct and special combination of glacial erosion exploiting stress-induced planes of weakness that may or may not follow sedimentary bedding planes. 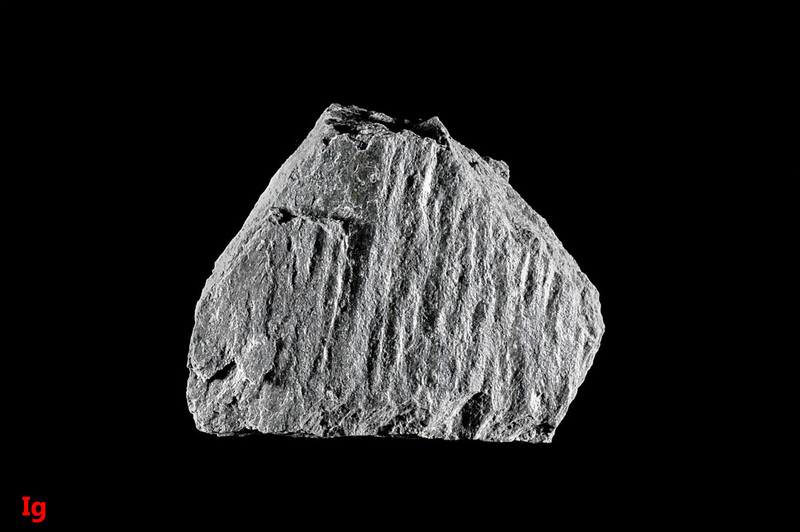 Features as shown above are common in Heart of Avalonia and appear in phyllosilicate-bearing volcanic rock as well as in sedimentary rock. The picture above left illustrates an asymmetric ridge (center), or equivalently, two ice-carved asymmetric valleys (left and right of center). The fluvial sedimentary rocks incorporate moderately dipping planes of weakness of compressional tectonic origin. Bedding plane weaknesses, where appropriately aligned, may have played an additional role in shaping the landscape. As ice flowed toward the foreground and/or to the right, it stripped off rock on the right-hand side of the valleys, following the planes of cleavage. Steeper slopes and irregular broken rock define the left-hand side of the valleys where there was no preferential plane of failure. The picture on the right (viewed 180 deg. opposite, from center of hill pictured left) illustrates a flat sloping tectonic cleavage plane in the foreground, along with several asymmetric glacially eroded hills behind. Asymmetric hills shaped by ice flow (roche moutonnee) can form with or without underlying planes of weakness in the rock. 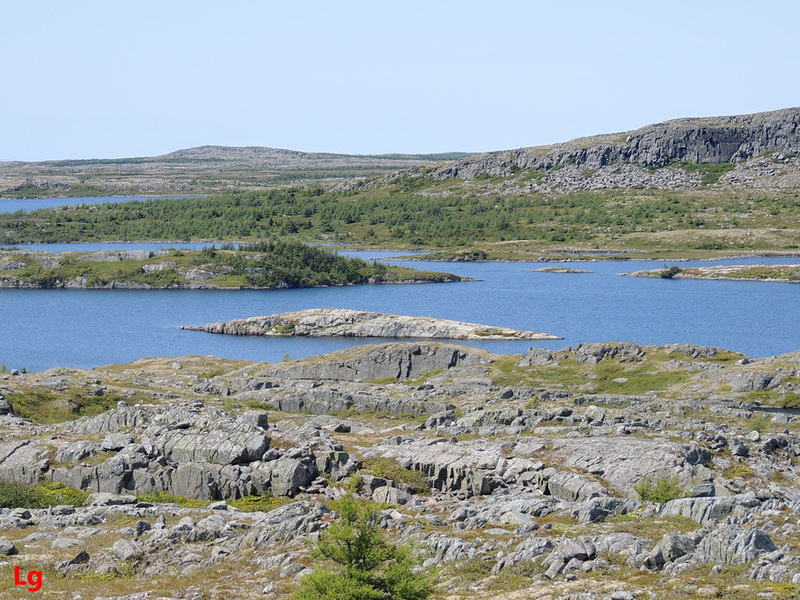 However, the hills shown above may owe their existence to a coincidental alignment of ice flow direction (from right to left in the picture) and oriented tectonic cleavage. The hills probably would have been reduced to glacial till if the direction of ice flow had been reversed. 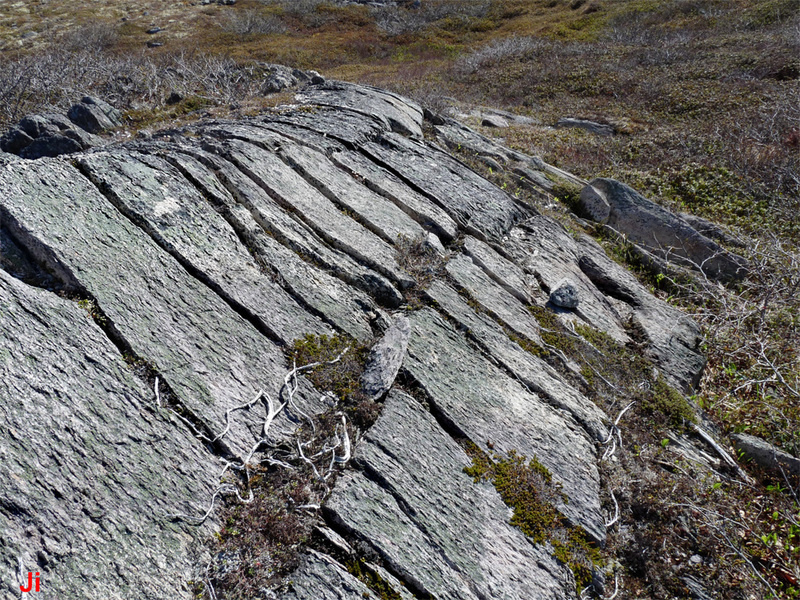 Very distinct cleavage and aligned jointing are demonstrated in the glacier-carved rocks shown above. Bedding in the phyllosilicate-rich fluvial sedimentary rock is indistinct in the landforms depicted and is not aligned with the jointing and failure surfaces shown. 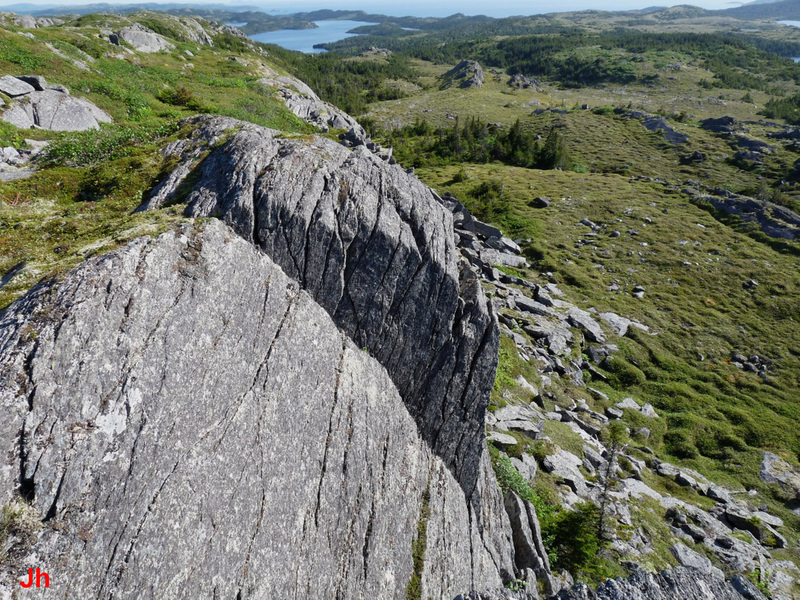 The sloped surfaces evident in the feature appear to be entirely the result of weaknesses in the rock that originated in directed compressional tectonic stress. Note the evidence of cleavage in the glacially deposited boulder, foreground. The hill seen above was shaped by glacial ice moving left-to-right in the foreground valley or by ice moving from the foreground valley toward and over the hill. The flat steeply-sloping surface could be a surface of tectonic cleavage but the surface could also have been formed by failure of the rock along a bedding plane. The far-side slope is jagged and nearly vertical. 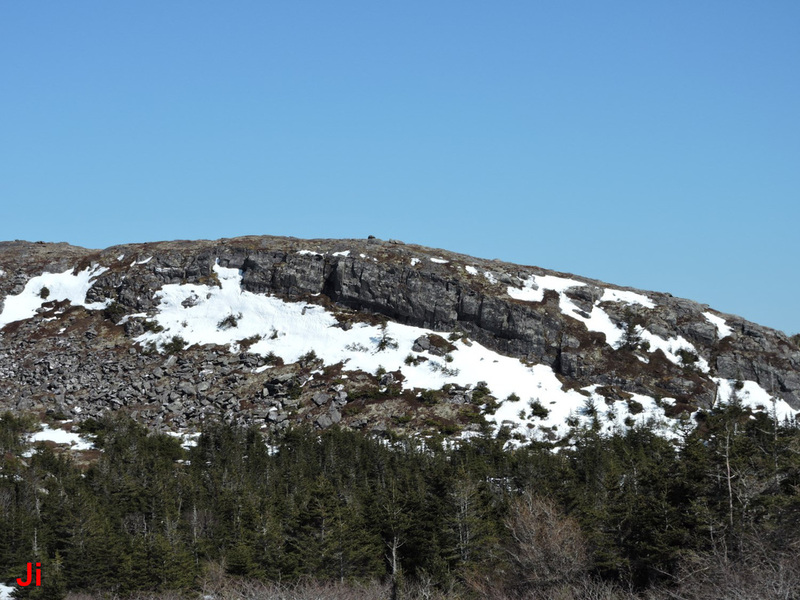 Glacially plucked rock can be seen near the top of the hill. The rock is sedimentary, alluvial or fluvial, and lacking in readily observable bedding planes. The ridge shown left above is comprised of metasomatized felsic volcanic rock with strong vertically-dipping compressional tectonic cleavage. A cleavage plane defines the edge of the ridge, which drops off in a vertical cliff to an accumulation of scree. 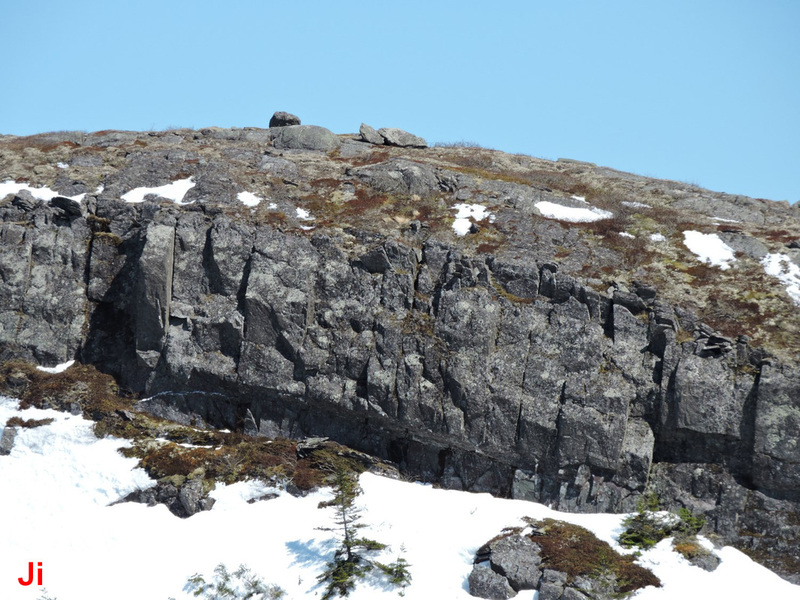 Ice and hydraulic pressure during the last glacial period, combined to a lesser extent with modern-day frost weathering, pushed cleaved blocks from the cliff into the pile of broken rocks seen below. 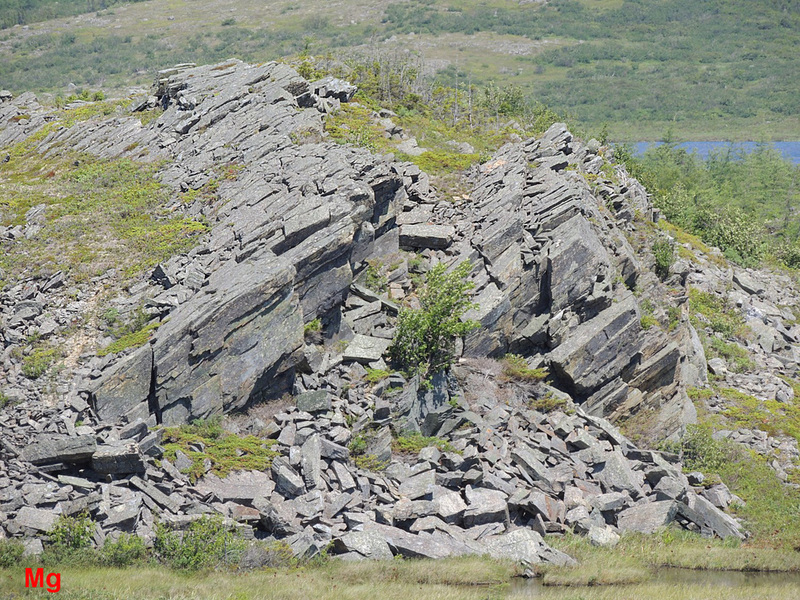 The picture on the right shows a similar ridge in sedimentary rock where plucking has pushed formerly-vertical joint blocks to an almost horizontal orientation. 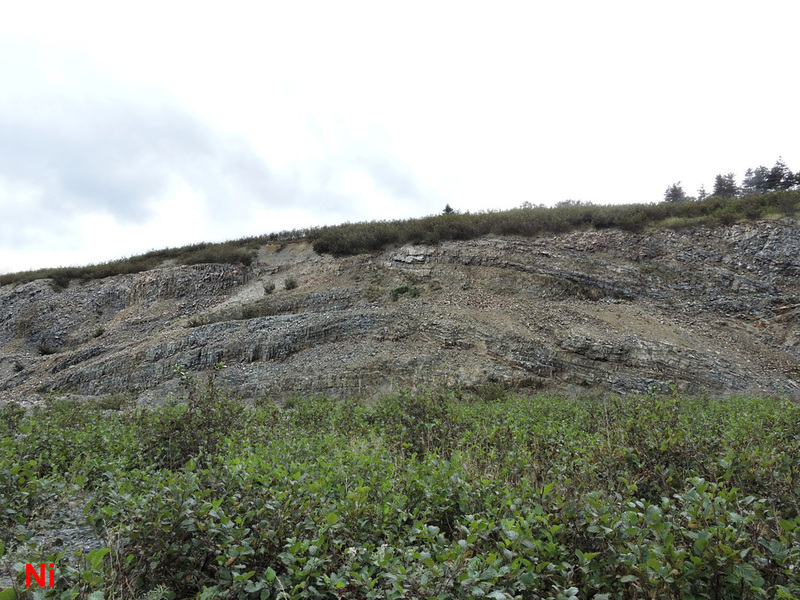 The accumulation of horizontal blocks seen near the center of the photo was placed during the last glacial period, but ongoing erosion undoubtedly dislodges some of these blocks, as are seen on the slope below. The flat vertical rock faces prominent in the above picture are the result of tectonic cross jointing. 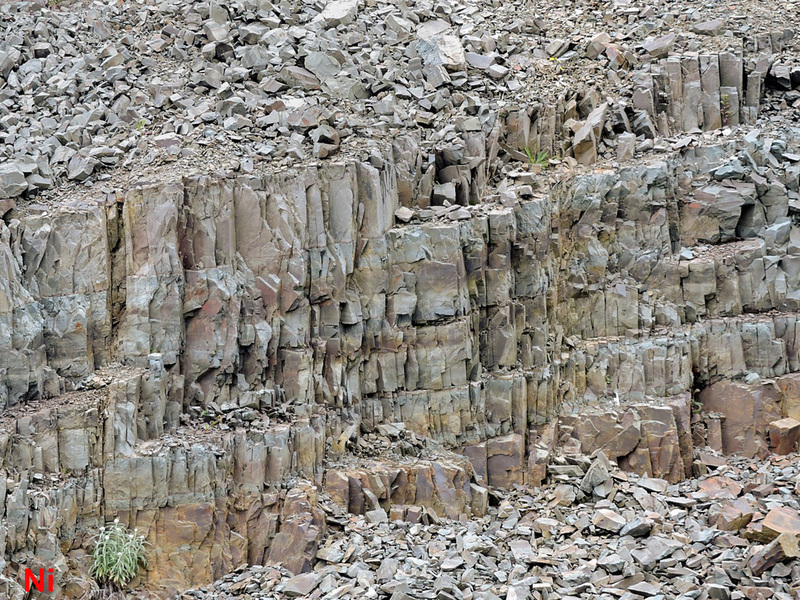 Another more densely spaced orthogonal joint set is also evident in these fluvial sedimentary rocks. This orthogonal joint set is longitudinal and is aligned in a strike direction about 25 deg. E of N, dip vertical. The dense longitudinal jointing follows a cleavage in the rock induced by compressional tectonic stress. 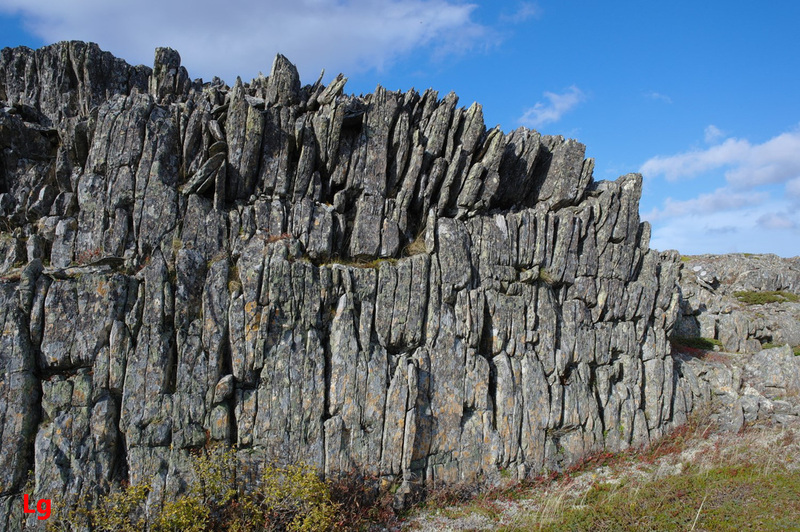 The flat vertical faces in the rock have been exposed by glacial erosion exploiting the planes of weakness set up by the pattern of cross joints. Glacial-period ice moved along the feature in a direction somewhat aligned to the strike of the now-exposed rock faces. Careful examination of the rock faces reveals lines running horizontally along the faces. These lines correspond to indistinct wavy bedding planes. The picture on the left above shows a corner in a lake formed by two perpendicular sets of joints. 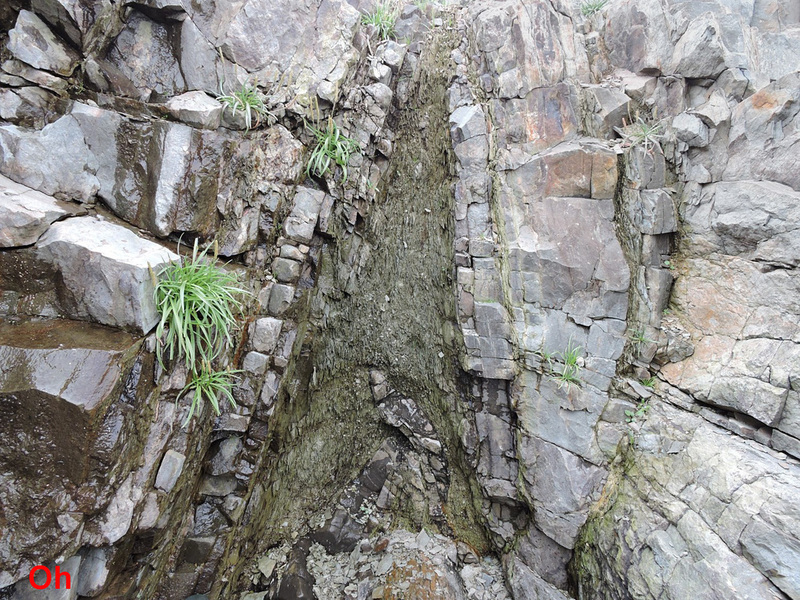 The vertical rock face shown touching the water in the left photo is a glacially cleaved surface following tectonic cross jointing in metasomatized felsic volcanic rock. This cross jointing is also visible in the foreground rocks, running perpendicular to the noticeable longitudinal cleavage and jointing. Joint blocks are seen in the foreground. Hydraulic pressure during glaciation has pushed the joint blocks leftward, tilting them toward the lake. 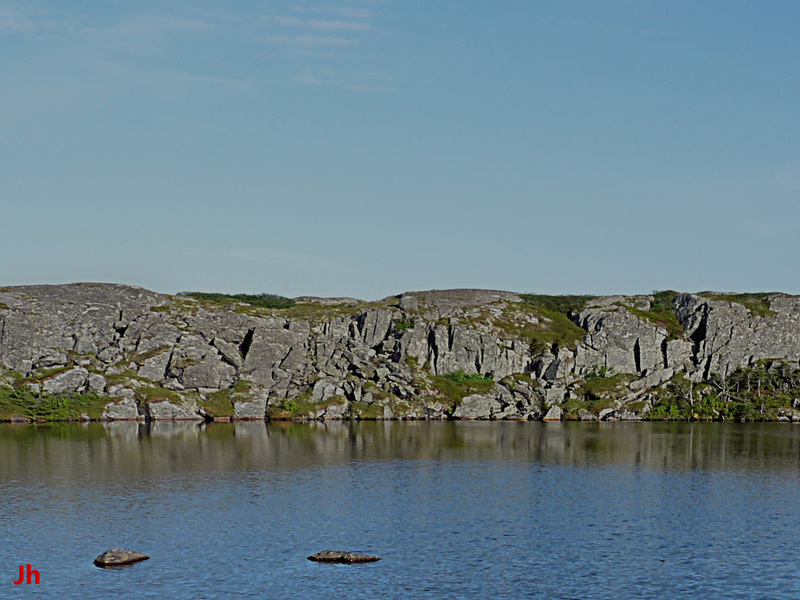 The foreground rocks depicted in the left photo are at the top of a vertical cliff (shown from across the lake in the right photo) that follows the longitudinal cleavage. Tilted joint blocks protrude outward from the cliff face at steep angles (not easily seen in photos because of perspective) and many large blocks have fallen over into the lake. This fluvial sedimentary rock feature is dominated by a dense set of extensively frost-weathered longitudinal joints. The vertical face of the feature, pointing toward the camera, is a surface of failure along a single cross joint. 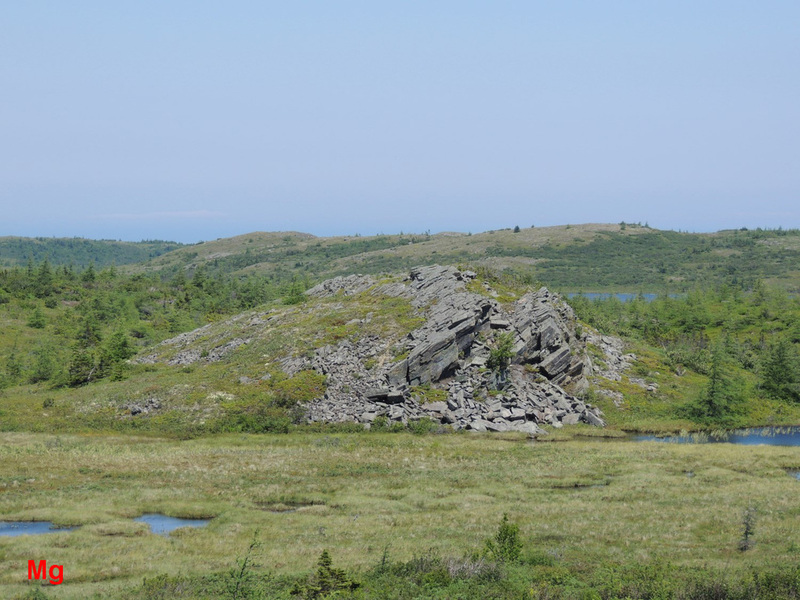 The rock that once lay in front of this now-exposed face was removed by glacial-period ice moving left-to-right across the field of view shown. Complex jointing is revealed in the above photograph. 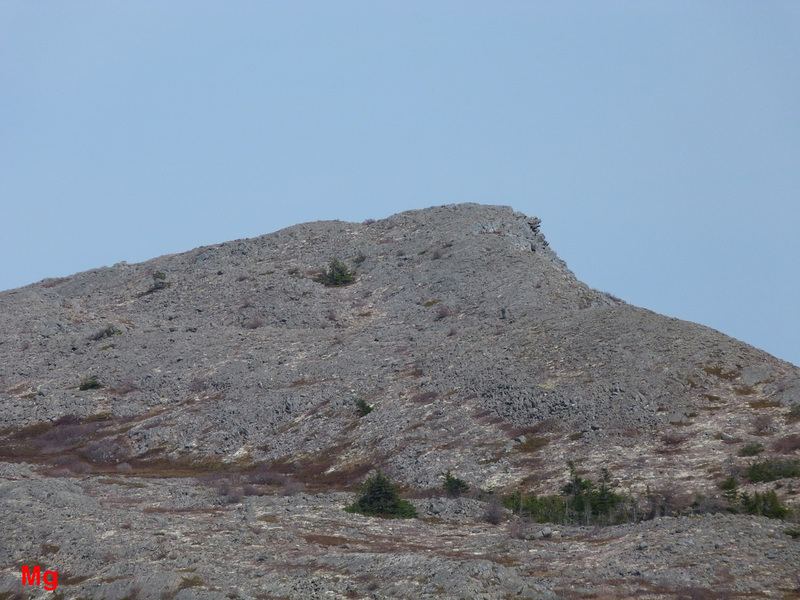 The vertical rock face seen nearest the water (appearing just below the island) is indicative of cross jointing as are several additional parallel faces seen nearer to the foreground. A set of longitudinal joints (roughly orthogonal to the cross joints) is apparent in much of the rock, including on the distant cliff face (upper right). Ice flow was either from left to right in the area shown, or it could have been from right to left. This area was near an ice center during the last glaciation, a region where ice radiated out in multiple directions. Planes of weakness striking parallel to the cross joints, but with dip about 30 deg., rather than 90 deg. are evidenced by two or more small glacially cleaved surfaces seen toward the left of the frame. The island, streamlined by ice flow, possesses a joint set (plainly visible from the rear side, not visible in the above photo) that dips at the low angle evident on the right side of the island as seen above. This joint set strikes roughly in line with the longitudinal jointing in the foreground rocks. The rocks pictured are fluvial sedimentary rocks with poorly defined bedding. The steeply dipping joint set shown above strikes at 60 degrees to the direction of compressional tectonic stress. These cross joints are more likely shear fractures or faults without much sideways motion. 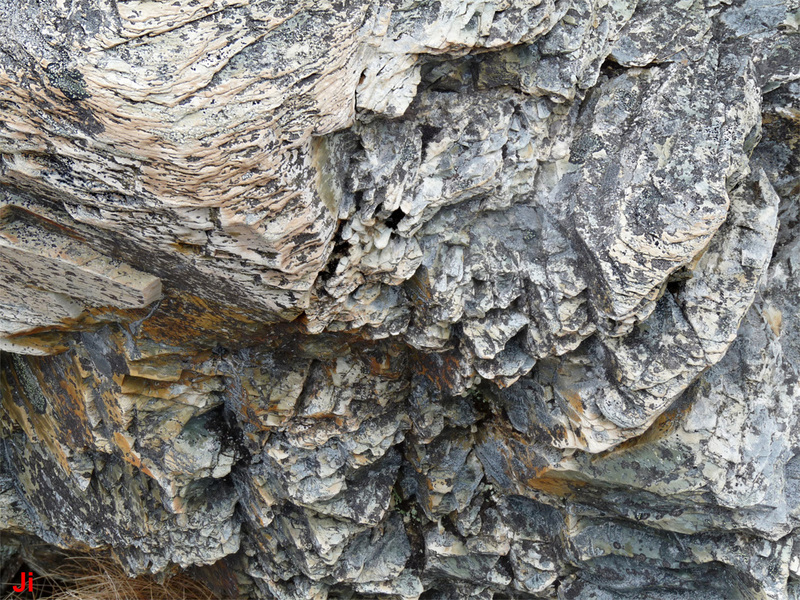 Many occurrences of cross joints in rock undergoing tectonic compression are likely of this type. The rock shown is volcanic with pronounced longitudinal cleavage, indicating the presence of the phyllosilicate minerals necessary to form planes of weakness perpendicular to compressional stress. The formation of shear fractures by small differences in the compression of adjacent regions of rock is a process that is not dependent on the presence of phyllosilicates. Ice flow across this feature was predominantly right-to left, streamlining the feature, as seen. Ice pressure during glaciation (plucking) has caused some joint blocks to be displaced from the front of the ridge. The plucking process was aided by the longitudinal cleavage.